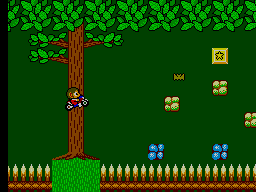 If Alex Kidd were your average Joe, he’d be a stonking twenty-one years old. Which in general arithmetic speak equates to a shitload of Janken matches. 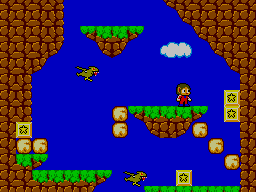 Despite his key-to-the-door coming of age, perhaps it is due to a certain blue hedgehog and fat Italian plumber that no-one has bothered to be-gift Sega’s first platform hero. Personally I can’t understand why: if the choice of bedding Kidd or Mario came into some obscure reality, it would be the former character’s trousers (jumpsuit?) I would be unabashedly yanking at. Why? Well, it’s rather simple: he is not an a) fat b) Italian c) plumber. Contrary to what you may think, Mr. Kidd could not sort yer plumbing. He is a Prince from the city Radaxian, who has set off to save his beloved population from an evil robot named “Janken the Great”. Similarly, his only brother Egle is also in dire need of rescuing, having been ‘Kidd’-napped (sorry) and held hostage in the Radaxian castle. 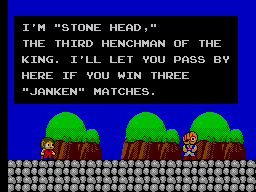 He must brave his way through sixteen locations, fending off enemies large and small, as well as three henchmen, imaginatively named Rock Head, Paper Head and Scissors Head. 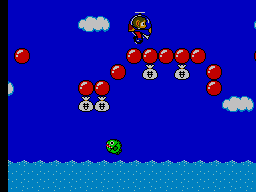 His final bosses include Hammer Head and the weeevil robot Janken. His choice of combat involves not sword nor gun, but an ancient technique which enables him to smash rocks to pieces, and has inflated his hands to epic proportions (y’know, big hands = big.......gloves). This ancient technique is more commonly known in-game as “Shellcore” (read: punching stuff). 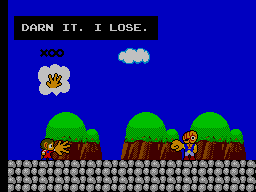 Despite Mr. Kidd’s elvish bedside manners which tempt me so, the end user need have no qualms that a five year old could rock-scissors-paper their way through the game quicker than you can yell “janken!”. Converse to first impressions the levels prove to be rather difficult – not a product of en mass enemia marching Kidd-wards – but because Alex need only brush jumpsuit with an evil birdie, frog, octopus or similar to lose a life. Those who are in the know of the ‘continue’ cheat upon the Game-sodding-Over screen can rest slightly easier than their non-cheating counterparts. That is if you can actually be bothered to continue in the first place. Whilst the levels are of acceptable length and navigationally simple, colourful and varied, undoubtedly most will notice that some are significantly more complex/impossible to achieve if you happen to lose certain goods pre-purchased from the over-friendly shop assistant. 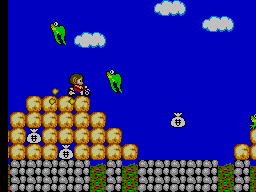 During your time using said travel aid you will become very protective of it – this is primarily because if you happen to accidentally hit hard matter (bricks, blocks, rocks, giant rotating flame) you will lose aforementioned copter. And suddenly you will find yourself stranded with nout but a huge hand in which to battle with, everything will become seventy two percent more difficult, and the world will end. It was during one of these accidental bumps that I swiftly cursed and finally gave up. I almost wept into my sweaty gamers palms as Alex fell a graceful 180 degrees to the ground below, smiling demurely and blissfully unaware that I had spent A SODDING HALF HOUR getting him there. Aside from the good and bad points of this cute platform, there are a few more fun issues to look out for. Most notably there seems to be a lot of bugs within the game, some good examples being documented on YouTube by user Segabr. So if indeed you are on the verge of giving the middle digit to both pint-sized prince and his estranged brother, you can always ditch heroism for binary glitches instead. However, I’d like to end this review on a positive note. Biased views of my sexpot and future husband aside, Miracle World is a pleasure to review. Its bright and inviting graphics mixed with classic gameplay and alternative boss scenes make it far more exciting than a blue hedgehog with a stupid haircut could ever hope to be. Call me an old-fashioned non-violent spoilsport, but I’d like to think that real heroes don’t exploit strength and stomping in order to defeat their enemies. Oh no, they do what all great peacemakers do; they play rock paper scissors.